Low pressure area (LPA) intensified into tropical depression, at least nine (9) areas in Northern Mindanao are placed under storm signal no. 1 before noon, state weather forecasters said. 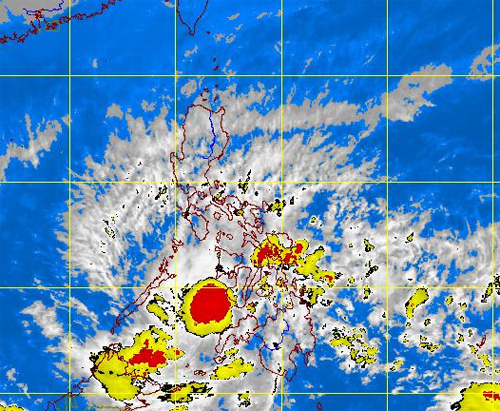 The Tropical Depression was codenamed as "AURING," Bagyong Auring may bring moderate to heavy rain over parts of Palawan and Visayas. Bagyong Auring will bring rain of 5 to 15 mm per hour (moderate to heavy). Meanwhile, PAGASA alerted those residents living in low-lying and mountainous areas under public storm warning signal No. 1 against possible flash floods and landslides. Estimated rainfall amount is from 5 to 15 mm per hour (moderate to heavy) within the 250-km diameter of the tropical depression. Comments or suggestions about "Bagyong Auring Update January 3, 2013" is important to us, you may share it by using the comment box below.